Once was a stretch. Twice was a coincidence. Three times? It's an epidemic. Reader Angus apparently had the same (melted) problems as our other two readers. 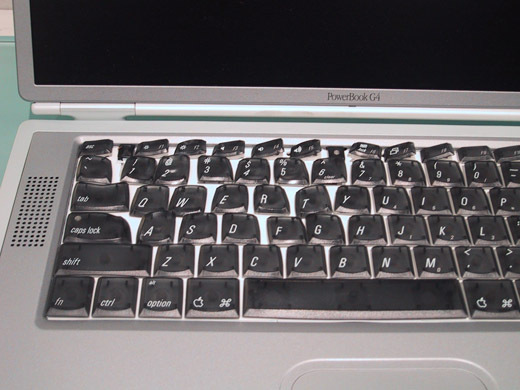 Yes, his Powerbook Titanium G4 also melted the plastic keyboard and the screen. After much haggling, he got the keyboard and screen replaced, but not the laptop itself. Catch Angus's story after the jump—though if he sent it to us five years ago, we might have been able to help him get a new laptop. It happened to me too ! About 5 years ago, after saving for ages I bought my very first MAC, a brand spanking new $3500 Powerbook Titanium G4. 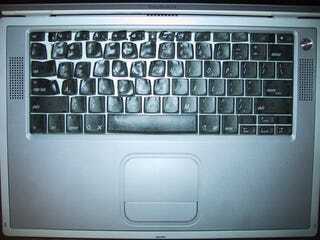 I closed the screen one night after a long session with my new supergadget, woke up in the morning to find my MAC so hot I could not even touch it, I carefully open the screen with a pair of wooden chopsticks to find the screen warped and the keys melted, amazingly it still worked. I tried to get it replaced as it was only a few weeks old but TEKSERVE in New York refused, they acted very suspicious and said they had never heard of this happening. After much emailing they only replaced the plastic keyboard and left the warped and damaged screen. I again sent it back to tekserve pleading for a replacement as there could be "unseen damage" after another week they replaced the screen but refused to replace the MAC for a new one as they had "never seen this happen before" I was forced to settle for the "repairs" and was made to feel "lucky" that they replaced anything at all. Apple did a good job of keeping this one quiet. It could have easily started a fire in my apartment, the problem definately is more widespread than I could ever have imagined.